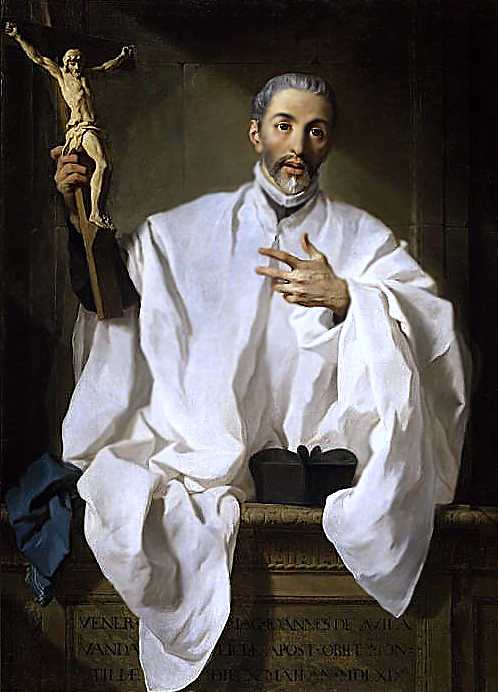 May 10 – St John of Avila, (1500-1569) – Doctor of the Church | ADULT CATECHESIS & CHRISTIAN RELIGIOUS LITERACY IN THE ROMAN CATHOLIC TRADITION: hosting ONLY True Christians!! !, or "How to think Catholic!!" Saint John of Ávila, called the “Apostle of Andalusia” was a Spanish priest, preacher, scholastic author, and religious mystic. John was born in Almodóvar del Campo, in the Province of Ciudad Real, of a wealthy and pious family of Jewish converso descent. At the age of fourteen he was sent to the University of Salamanca to study law but returned home after a year, where he spent the next three years in the practice of austere piety. His sanctity impressed a Franciscan friar journeying through Almodóvar, on whose advice he took up the study of philosophy and theology at Alcalá de Henares, where he was fortunate to have as his teacher the noted Dominican friar, Domingo de Soto. While he was a student his parents died and after his ordination he celebrated his first Mass in the church where they were buried, then he sold the family property and gave the proceeds to the poor. He saw in the severing of natural ties a vocation to foreign missionary work and prepared to go to Mexico. In 1527, while he was in Seville looking for a favourable opportunity to set out for his new field of labour, his unusually great devotion in celebrating Mass attracted the attention of Hernando de Contreras, a local priest, who mentioned him to the Archbishop of Seville and Inquisitor General, Alonso Manrique de Lara. The archbishop saw in the young cleric a powerful instrument to stir up the faith in Andalusia, recently reclaimed for Spain in the Reconquista by Servant of God Queen Isabel the Catholic and Ferdinand II of Aragon, having expelled the Berbers and Moors from Spain. After considerable persuasion, Juan was induced to abandon his journey to America. John of Avila is also remembered as a reformer of clerical life in Spain. He founded several colleges where his disciples dedicated themselves to the teaching of youths. Among the disciples attracted by his preaching and saintly reputation were St. Teresa of Ávila, St. John of God, St. Francis Borgia and the Venerable Louis of Granada. Of special importance was the University of Baeza established in 1538 by a papal bull of Pope Paul III. He served as its first rector, and it became a model for seminaries and for the schools of the Jesuits. He is especially revered by the Jesuits. Their development in Spain is attributed to his friendship and support to the Society of Jesus. He began his career as apostolic preacher of Andalusia, aged thirty. After nine years he returned to Seville, only to depart for the wider fields of Cordova, Granada, Baeza, Montilla and Zafra. For eighteen years before his death he was the victim of constant illness, the result of the hardships of his apostolate of forty years. He died on 10 May 1569 in the town of Montilla in the Province of Córdoba. 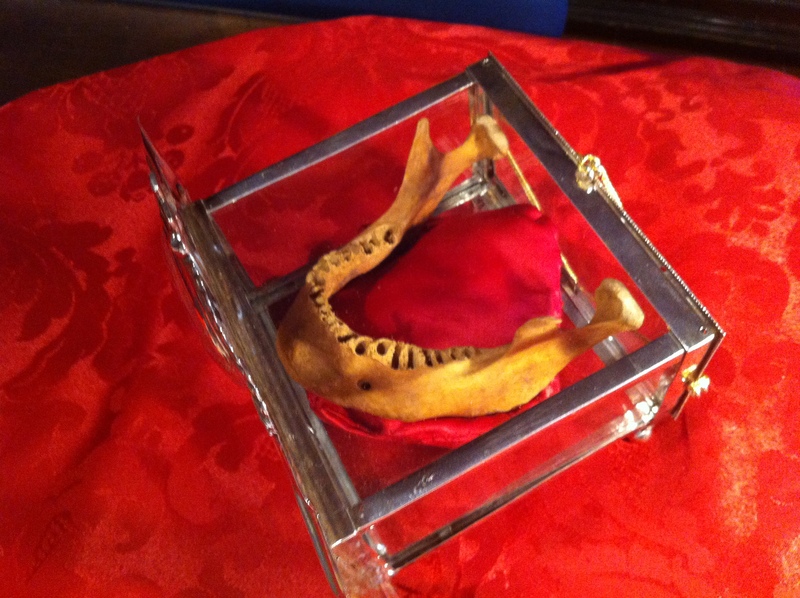 He was buried in that city, in the Jesuit Church of the Incarnation, which now serves as the sanctuary to his memory. Saint John of Ávila’s works were collected at Madrid in 1618, 1757, 1792 and 1805; a French translation by d’Andilly was published at Paris in 1673; and a German translation by Schermer in six volumes was issued at Regensburg between 1856 and 1881. His best-known works are the “Audi Fili” one of the best tracts on Christian perfection, and his “Spiritual Letters” to his disciples. (1) The alumbrados (The Illuminated) was a term used to loosely describe practitioners of a mystical form of Christianity in Spain during the 15th-16th centuries. Some alumbrados were only mildly heterodox, but others held views that were clearly heretical. Consequently, they were firmly repressed and became some of the early victims of the Spanish Inquisition. A labourer’s daughter known as La Beata de Piedrahita, born in Salamanca, came to the notice of the Inquisition in 1511, by claiming to hold colloquies with Jesus and the Virgin Mary; some high patronage saved her from a rigorous denunciation. She is often, as The Catholic Encyclopedia cautiously notes, “cited as an early adherent” of the alumbrados’ errors, though “it is not certain that she was guilty of heresy”. Some recent scholars, like the Dominican historian and theologian Álvaro Huerga, who takes a relatively favorable view of her, question, on chronological and other grounds, the tendency to associate her with that movement, seeing her rather as “pre-alumbrados”. Henry Charles Lea, in his “A History of the Inquisition in Spain”, mentions, among the more extravagant alumbrados, a priest from Seville named Fernando Méndez, who had acquired a special reputation for sanctity: “he taught his disciples to invoke his intercession, as though he were already a saint in heaven; fragments of his garments were treasured as relics; he gathered a congregation of beatas and, after mass in his oratory, they would strip off their garments and dance with indecent vigor — drunk with the love of God — and, on some of his female penitents, he would impose the penance of lifting their skirts and exposing themselves before him.” Méndez died before the Inquisition could bring him to trial. Ignatius of Loyola, while studying at Salamanca in 1527, was brought before an ecclesiastical commission on a charge of sympathy with the alumbrados, but escaped with an admonition. Miguel de Molinos was also accused of sympathy owing to some similarities between his book The Spiritual Guide and the teachings of the early alumbrados, Isabella de la Cruz and Pedro Ruiz de Alcaraz. Their persecution, by Inquisitional standards, was not particularly severe. Those convicted of engaging in the mystical practices and heresy of the alumbrados were not executed, few endured long-term sentences, and most were tried only after they managed to acquire large congregations in Toledo or Salamanca. Not all, however, were so fortunate. In 1529 a congregation of naïve adherents at Toledo was subjected to whippings and imprisonment. Greater rigors followed, and for about a century alleged connection with the alumbrados sent many to the Inquisition, especially at Córdoba. In spite of this determined action, however, the heresy maintained itself until the middle of the 17th century. The connection of later alumbrados, whose practices varied in different places, to the original alumbrados, Isabella de la Cruz and Pedro Ruiz del Alcaraz, is debatable, but the continuing influence of their teachings is not improbable. A century later, another, more obscure body of Illuminés came to light in the south of France in 1722, and appears to have lingered till 1794, having affinities with those known contemporaneously in the United Kingdom as ‘French Prophets’, an offshoot of the Camisards.